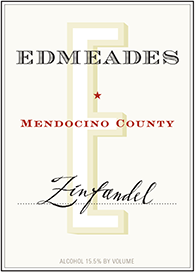 Using grapes grown in Mendocino County’s rugged coastal mountains, Edmeades crafts bold, intense Zinfandels of distinctive character and personality. We work side by side with a small group of growers, who year after year produce some of Mendocino County’s most highly-prized grapes. We prefer a delicate touch in our cellar, allowing each vineyard to be fully expressed in the wines we make. Offering plenty of Zinny character, it’s dry and brisk in mouth-cleansing acidity, with soft tannins and rich flavors of dusty baking spices, blackberry purée, cherry compote, cola, shaved dark chocolate, red licorice and a savory coating of toasted cedar wood. A great accompaniment to barbecue, game, roasted chicken, stews and lasagna. Intense fruit aromas of cherry preserves, framboise, and cinnamon, with more subtle background hints of wild sage, pine needles, and mushrooms. Ripe cherry and raspberry flavors are accentuated by warm spices and cracked black pepper notes. 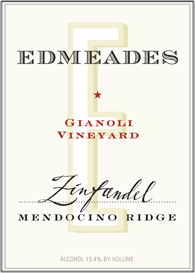 Soft tannins and balanced acidity elevate the fruit intensity. Dark chocolate, vanilla, and caramelized sugar tones linger on the finish. Aromas of fresh blackberries, black currants, cedar, and spicy forest hardwoods blend together in the glass. On the palate, blackberry liqueur and plum flavors are complimented by a slightly smoky and meaty character. 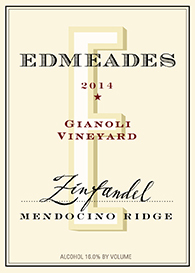 The wine has ripe, soft tannins, and a mouthwatering acidity. 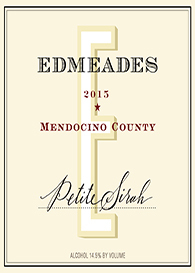 Aromas of blueberry compote, toasty oak, vanilla, and roasted coffee beans are exhibited in the 2013 Mendocino County Petite Sirah. The wine is dense and full-bodied, with flavors of black and blue fruits. Smoked meat and spice characteristics accentuate the finish. The tannins are firm, yet approachable. 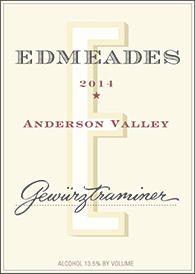 The 2014 Edmeades Anderson Valley Gewurztraminer displays aromas of lemon verbena, fresh rose petals, stone fruits and citrus blossoms. The citrus character continues to the palate, with flavors of orange zest and Meyer lemon, and transitions to sweeter nectarine notes. The round texture, bright acidity, and overall freshness make this wine versatile, whether enjoying as an aperitif, out on the patio, or accompanying light and delicate dishes. So broad and deep are the flavors in this mountain-grown, to call it intense is an understatement. Massive in briary, brambly blackberries, it has layers of baking spices, especially cloves and cinnamon, orange zest, and a sweet, concentrated burst of liquefied red licorice. There’s also meaty note: think teriyaki beef tartare. The alcohol is high, as indeed it has to be in a wine like this, which would not be ripe without it; but there’s no heat, just a mouth-filling warmth that rewards slow sipping. 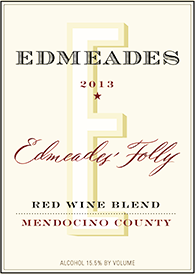 The 2013 Edmeades’ Folly has aromas of black fruits, blueberries, plums, and leather. The texture is rich, round, and lush, displaying flavors of dark fruits, anise, and pepper. Notes of toasted oak and vanilla accentuate the finish. 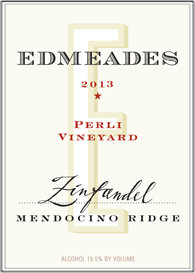 This wine is made in honor of Dr. Donald Edmeades, the founder of Edmeades and pioneer of Anderson Valley grape growing.